NEW DELHI, India (CNN) -- India's top law enforcement official Thursday said suspicion points "unmistakably" to a Pakistani link to the Mumbai terrorist attacks. India's Home Minister Palaniappan Chidambaram has continued to suggest Pakistani involvement in Mumbai. His Pakistani counterpart, however, repeated assertions that India has yet to provide the country with any evidence of the connection. Indian Home Minister Palaniappan Chidambaram told India's parliament that investigations into last month's attacks in the country's financial capital were still not complete. "I am, however, able to say that the finger of suspicion unmistakably points to the territory of our neighbor, Pakistan," he said. "The interrogation of the captured terrorist has yielded valuable material evidence. The origins of the 10 terrorists who entered India have been established conclusively." The captured suspect was the only one of the 10 gunmen to survive the attacks, which left more than 160 people dead in three days of sieges around Mumbai. "Abundant" evidence has also come from the inflatable rubber dinghy and the hijacked fishing vessel used by the gunman to reach Mumbai, as well as the bodies of the dead gunmen, Chidambaram said. It had allowed investigators to "reconstruct the sequence of events from the origin to the targets," he said. Pakistan's interior minister told reporters in Islamabad, meanwhile, that Pakistan had yet to find any links between Pakistani militant groups and the Mumbai attacks. Rehman Malik said, however, that Pakistan's investigation was continuing and that the country would present any evidence it finds to the international community. He said an offer for a joint investigation with India was still on the table. "We have made some arrests and we continue to make arrests," Malik said. "We will extend full cooperation to bring these culprits to justice." Meanwhile, Hafiz Saeed -- the founder of the militant Lashkar-e-Tayyiba (LeT) group blamed by India for the attacks - has been placed under house arrest at his residence in Lahore, a senior Pakistani government official trold CNN. A magistrate Thursday ordered the captured suspect, Mohammed Ajmal Amir Kasab, to be held for another 14 days, at which time he will have a court appearance, the police press office said. The suspect currently has no lawyer. Chidambaram also called Thursday for a sweeping overhaul of the country's intelligence and counterterrorism agencies after the massacre in Mumbai, declaring the country was in "the eye of a storm of terror." 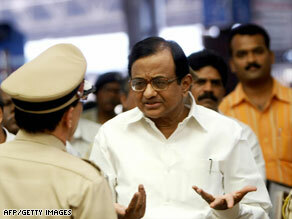 "All aspects regarding intelligence are under my examination," Chidambaram told India's parliament. "Some changes have already been made, and more are under way." Chidambaram took office when his predecessor resigned after the attacks. He said India's police, military and intelligence-gathering agencies would be restructured to enhance security, and that the government would ask lawmakers for tougher measures to battle extremist groups. "Given the nature of the threat, we cannot go back to business as usual," he said. "In the next few weeks and months, it will be my endeavor to prepare the country and the people to face the challenge of terrorism." The home minister said he had found failings in the way Indian agencies handled intelligence. Vague or imprecise intelligence reports were often deemed "not actionable," and responsibility for acting on intelligence was diffused among a number of agencies. In the case of the Mumbai attacks, Chidambaram said, departments failed to follow up on crucial intelligence. The heads of India's coast guard and naval intelligence had received reports of a suspected LeT vessel attempting to enter Indian waters, he said. The coast guard tried and failed to locate the vessel, while the navy found the vessel was in Pakistan's territorial waters. Without more information, however, the navy took no further action, he said. Chidambaram did not say whether a follow-up of the reports could have prevented the attacks. Indian police have said the sole surviving gunman told them he was trained by LeT. The terrorist group has denied responsibility for the attacks. This week, Pakistan arrested two top LeT leaders and raided a camp believed to have been used by LeT for training.